Summer started abruptly this year : since Saturday we have here in Athens Greece 40 ˚C (104 ˚F)!! Difficult to quilt with this heat, but what I really enjoy is to hand sew very early in the morning, in the back yard, before it becomes too hot. Among my hand sewing UFOs, I found those Liberty hexagons abandonned last year... I will try to finish a pillow size 19.50'x19.50" (50 cm x 50 cm). I had done a tutorial for those paper pieced hexagons. 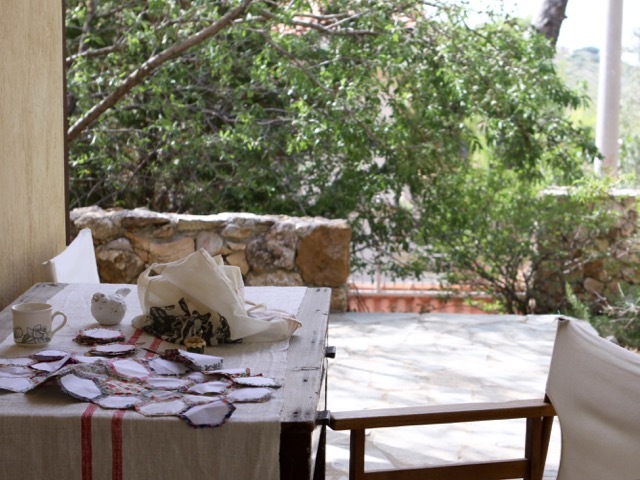 During sewing I can admire my almond tree full of almonds, hoping the harvest will be good this year! I can picture you sitting on your patio beside your almond tree! So pretty! Imagine having an almond tree! I was picking cherries last night...but not nearly as exotic! The photos are so beautiful, they don't show the heat though. It looks like you have a nice place to sit and stitch in the shade though. Stay cool! It looks like a very idyllic sewing spot! Glad you can find coolness and sewing in the mornings. I'm sure your Liberty pillow will be beautiful. I'm fondly remembering meeting you in Paris last June. I hope it cools in Athens soon! 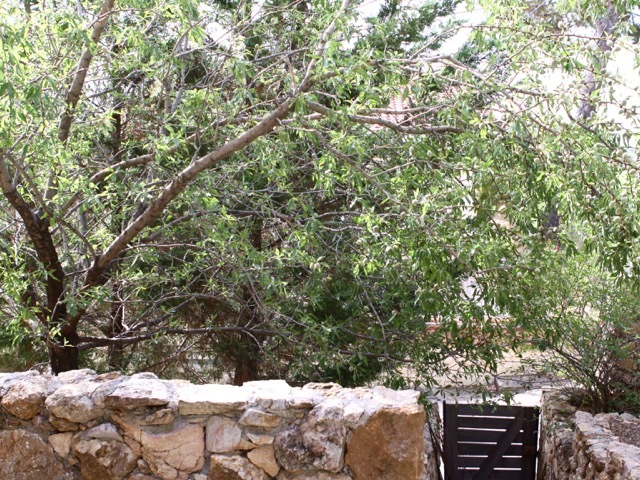 I can almost feel the heat looking at the beautiful stone walls and the colour of the leaves. With this post you have answered a question I have just asked of you in an email. You are still beating the heat in Athens - keep cool and enjoy the almonds. Here in Australia it's the opposite, winter was late coming and struck suddenly. Only 9 degrees today, which is more to my liking than 40! Good idea to enjoy some time outside in the morning. 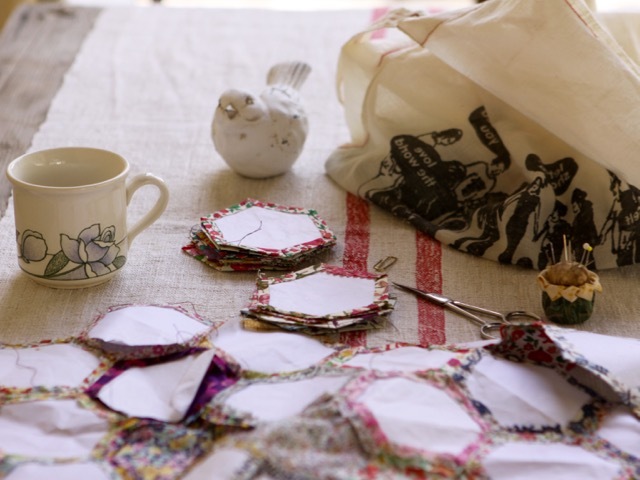 Piecing hexies is a lovely way to get your sewing fix in the hot weather. It looks cool in your garden. Lovely to sit there in the early morning. I have just balconies in Athens, but that is too hot even in the morning. Sparta is much better, there it cools down during the night. Looking forward to seeing your pillow. I too enjoy stitching in the morning right now. What a lovely spot you have for quilting in those cool morning hours! 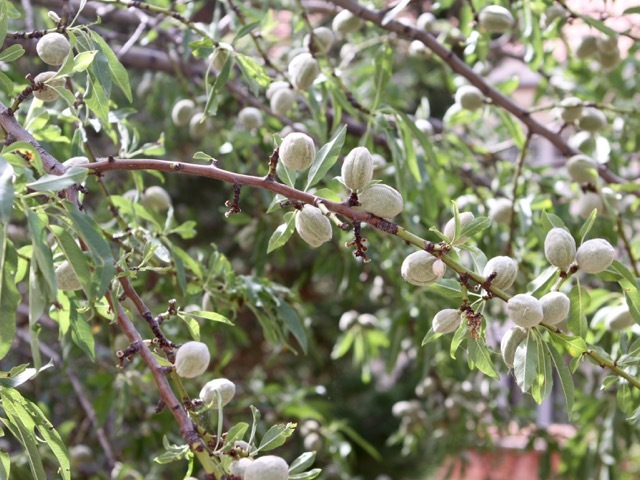 I've never seen an almond tree, so thank you for sharing your pictures! A trip to Greece this morning! Thank you so much for the hospitality - your porch setting is lovely ang the gardens are a delight! I've just spent my early morning hours doing some hand quilting; house is quiet, songbirds flitting about outside my window, Kitty content to purr and watch them. Glad to find you through Crazy Mom Quilts.